Mako has developed a unique catamaran design Fully Inflatable Surf Rescue boat– size 3.8m, size 4.0m and 4.2m High Speed for Search and Rescue and surf lifesaving uses. This range consists of boats that are very light and extremely maneuverable due to the catamaran shape hull that allows these boats to run on a pocket of air making them particularly effective and highly stable passing over waves in sea spray and backwash. 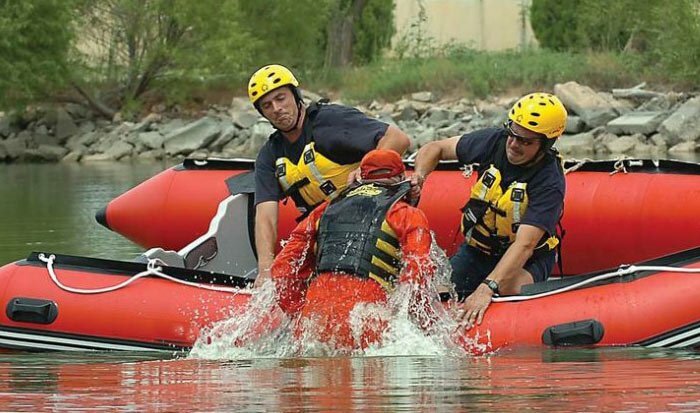 Accessories and ergonomics of the boat are also specifically designed to optimize the effectiveness of the crew in all the phases of rescue operations. Accessories: Flexible fuel tank, footstraps, integrated paddles and flexible storage bags to hold tools & small equipment. Safe and particularly stable due to catamaran design.